Finally after so many spamming of fake themes of orkut by many orkut users, orkut has finally launched the orkut themes officially on the test basis which is right now limited to US orkut users only for the time being but will be soon available for every one. How can I change my profile theme? you can change the theme by clicking on a link(if its enabled in your profile) 'change theme' just near top right hand side of your orkut home page where your email ID is. After clicking on it you will be redirected to your edit profile page and there you will see a new tab of Themes, there you can select a theme of your choice (although they are limited for the time being). Who can see my theme? Your theme can be visible by you only,but soon if will be visible to your friends also.This is a way to make your profile unique and personalized. How I can disable the theme? You can also choose not to use any theme by clicking on the check box just above the available themes and your profile will again switch back to default theme of orkut. Here is the much awaited fully explained step by step procedure of how to upload multiple images in orkut album with screenshots. 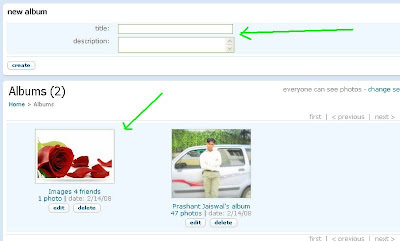 1) There can be maximum of 100 images in a single album (this means there can be maximum of 10 such albums in your orkut profile with 100 images). 2) Maximum image size should be less than or equal to 5 MB and it should be in correct format. 3) The supported image formats are jpg, png and gif formats. 4) Single image upload is still available in all the web browsers. 5) You can make any image in album as album cover. 6) Multiple image upload is not working in all the web browsers, right now it is only supported in Internet Explores IE5, IE6 and IE7 versions. Step 1: First open your album in internet explorer(IE) and go to create a new album by writing its name or description or click on any existing album. step 2: You can create a new album by writing the album name and its description in the text boxes provided on top of the album page as shown. In the internet explorer when you will create a new album or click on any existing album then you will see a new text link on right hand side of album that is "New! upload multiple photos>>" just click on that link. For the rest of the web browsers like Firefox, opera and safari I am expecting same type of arrangements from Google soon.